The whole idea of going abroad for so long was one that evolved somewhat from our frustration with lack of time. Time had been slipping by all too quickly lately. The monotony of going to work, grocery shopping, dropping kids at school, and all the normal activities were blending months into years, punctuated only by holidays and birthdays. At this rate, our children would be grown and off before we knew it. I’ve heard some people refer to this phenomenon as the ‘quickening’, as you get older time goes by faster. By interrupting our normal life we are hoping to slow things down. Is it working? Well, everyday is a new adventure with new challenges. To some degree, I suppose time has slowed but I still have no time to write this blog, do laundry, or prepare for our next voyage. What it has forced me to think about, is to use each precious hour of each precious day. We’ve been moving a lot lately and have seen and done some amazing things. We left Chang Mai, spent a couple nights in Chiang Rai then caught a boat down the Mekong River 300km to Luang Probang, an extremely charming town in Laos. The Mekong is a river that runs through China, Burma, Laos, Thailand, Cambodia and Vietnam, the world’s 10th-longest. It’s silty and dark and boils with wirlpools and rapids. Even though it was hot, there was no swimming. On our boat were people from all over the world; France, Spain, USA, England, Netherlands, South African, and of course Canada. We passed through jungled mountains and small villages, the banks of the river dotted with farmers growing peanuts. Sometimes we would see a village but often it was just raw jungle with the odd narrow wooden river speedboat (the passangers wearing helmets) flying by us. We made a few stops: a river village and a buddhist temple set high in a river cave and an overnight stay which included a dance and music performance from the local hill tribe. 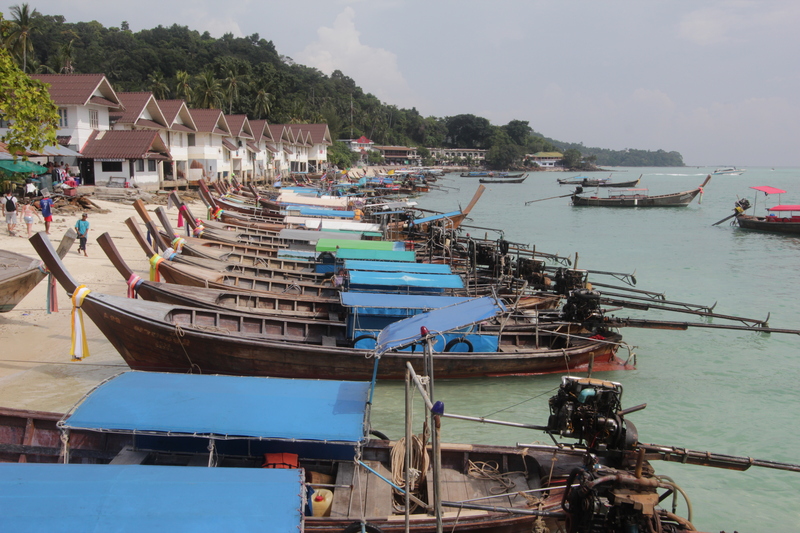 After our far-too short stop in Luang Prabang we’ve spent the last two weeks making our way around the south-west coast of Thailand between Burma and Malaysia. 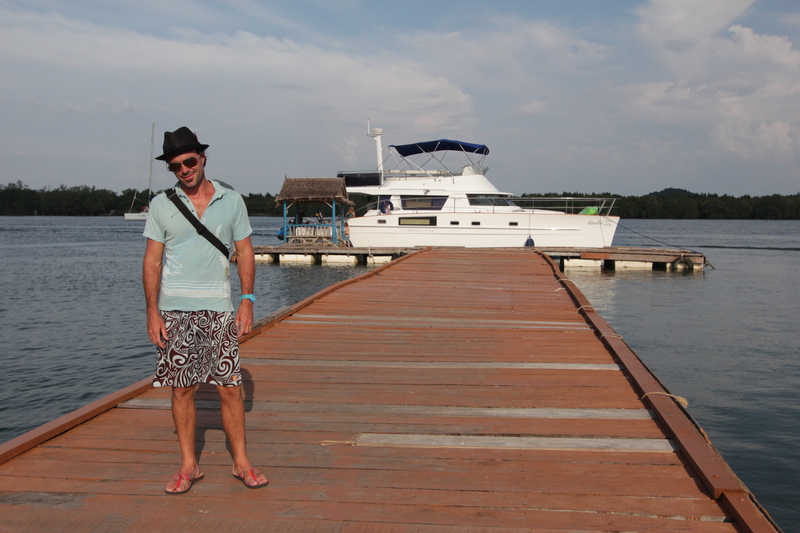 With the potencial for cruising the Andaman Sea so close, Don just couldn’t hold himself back, so rented a boat out of Puhket with a captain. It’s a luxury to be living on the sea again. 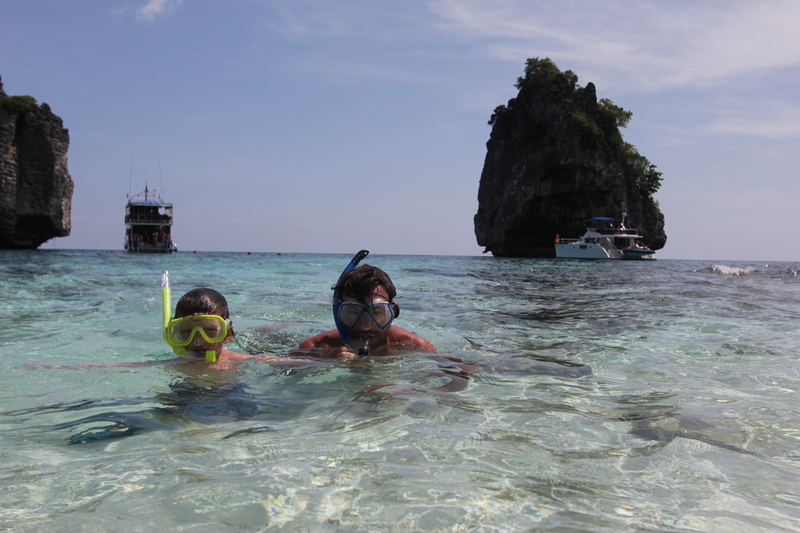 Snorkelling every day and exploring the rugged limestone coast and islands. Caves are everywhere here. 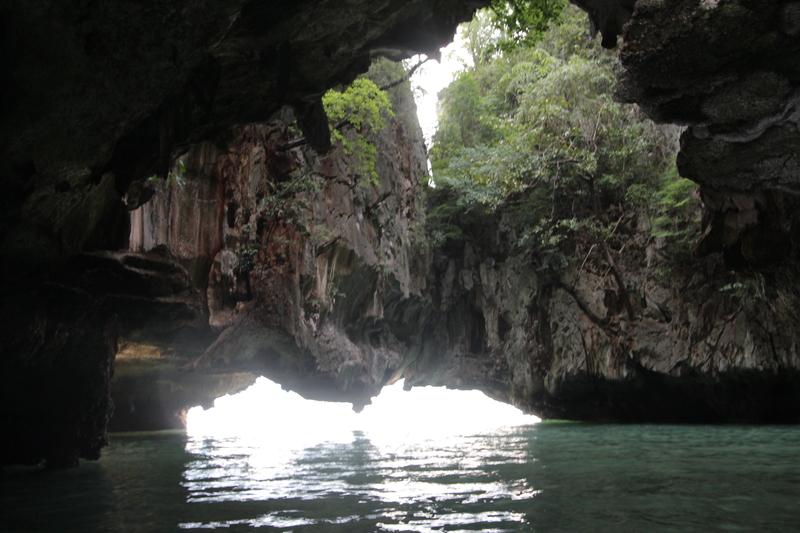 We were able to take our boat into this ‘hong’ (room), a cave complex that has collapsed into a roofless room. The water is very warm and we’ve been swimming for hours at a time. Ashton swims like a baby orca, just ahead and beside his dad. Whenever he gets water in his snorkle, he turns around, climbs on don’s back and empties it out, its very cute to watch. They are all so brave. We swam through a cave of sorts and no one said a thing (it was only me that thought it a little freaky). 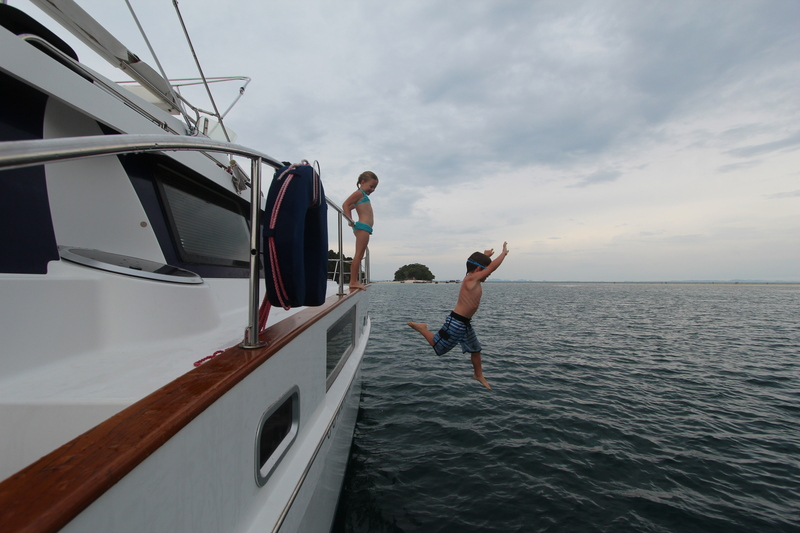 Gwen and Kate are such strong swimmers too and everyone loves to jump off the boat! The area is beautiful, bit it’s also overrun with tourists and boats in places; you really have to pick your spots (we’re so lucky to have the B.C. coast relatively all to ourselves in the summer!) I’ve never seen so much boat traffic and some of the boats are so overloaded with people that it’s comical. They teeter back and forth, the scene like one from a Richard Scary picture book, people looking like they’re going to tumble over the sides. 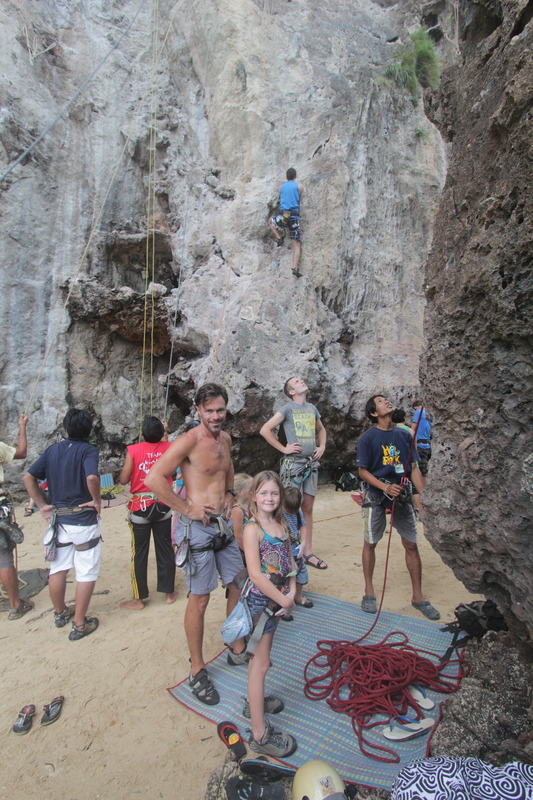 We ended up near Krabi, Thailand, at Railay Beach, a rock climbers mecca, and a very chilled-out place. 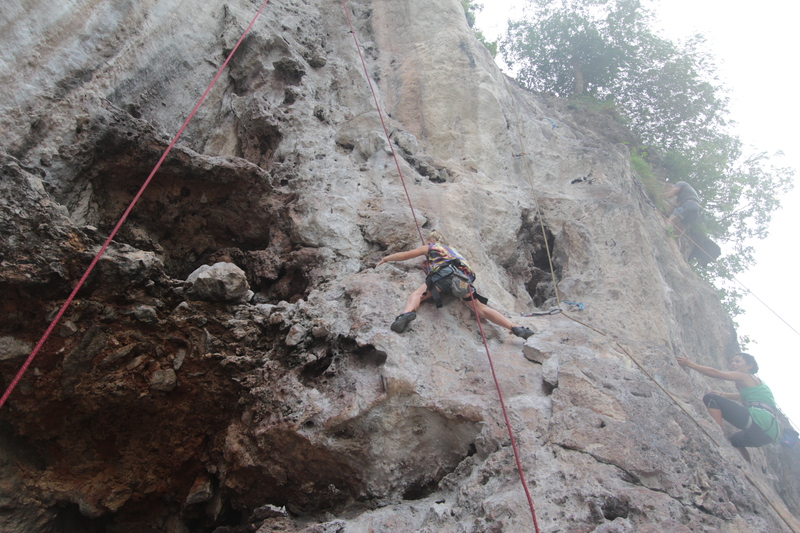 The scenery is insane, with giant dripping limeston cliffs that hang from every side. 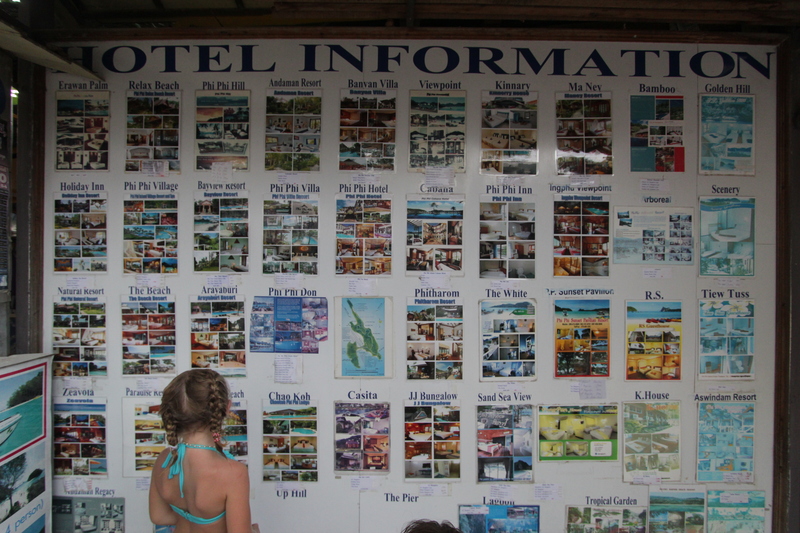 Don thinks it may be his favourite vacation place on the planet. Tomorrow a new series of adventure as we fly Bangkok to Delhi. I swear your kids are going to end up working for the jacques Cousteau foundation one day or the aquarium..
Can’t wait to hear about your India expeditions.